Kiss and Kidney had been expected to work alongside the young director of rugby. 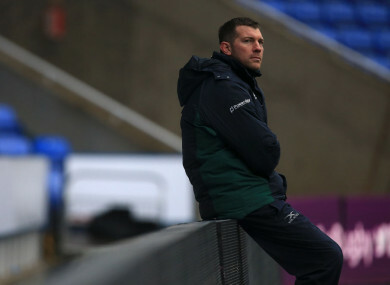 LESS THAN A fortnight after the appointment of Les Kiss and Declan Kidney, Nick Kennedy has departed his role as London Irish director of rugby. The 35-year-old was name-checked by incoming head coach Kiss as a coach he was keen to work with. However, Kennedy has now opted to follow technical director Brendan Venter in parting ways with the struggling Premiership club. “We believed that (Kennedy) had a promising career in front of him as a coach, which we had hoped that he would fulfil under the guidance of Declan Kidney and Les Kiss. So, we’re disappointed that he has decided to move on,” CEO Mick Crossan said in a statement this afternoon. Crossan praised Kennedy’s impact on the club after the former second row oversaw last season’s promotion from the Championship, a task which looks likely to be on the agenda for the Kiss-Kidney axis with the Exiles currently 14 points adrift at the foot of the Premiership table. This afternoon’s club statement says that Kennedy had been asked to work alongside Kiss and technical consultant Kidney, but his resignation has been accepted and he leaves Hazlewood with immediate effect. Email “Director of rugby Nick Kennedy leaves London Irish after Kidney-Kiss appointment”. Feedback on “Director of rugby Nick Kennedy leaves London Irish after Kidney-Kiss appointment”.